It’s time to start talking about the most important word in universal basic income – the concept of universalism. Institutional structures of the industrial society are becoming incapable of enhancing a spirit of progress and a sense of fairness. The vast majority in many highly developed countries do not believe that the next generation will be more prosperous than the current one. It is evident that we need new forms of social security to serve the needs of people trying to build their lives and flourish in the midst of the current transformation. Universal basic income (UBI) has emerged as a potential solution. UBI experiments have been recently launched in a number of countries. However, reforming systems of redistribution is not necessarily enough. What we need is new universalism that can tackle the diminishing sense of belonging. In addition to redistribution and social security, we could increase individual liberty by having more commonly owned goods and services. We in Demos Helsinki believe that it is time to examine social security in a broader perspective. Universalism should be more than just a way of redistributing wealth. It should empower the individual to embrace autonomy and agency. For us, universalism is more a metaphor for a future paradigm of economic policy than a single policy measure. Our publication aims to explore how we could ensure that there is this type of universal structures when we enter the post-industrial and post-fossil fuel era – the next era of well-being. The greatest change involved in transitioning towards a society where paid work is increasingly contingent would be the growing role of assets that are not being constantly traded for money. People need to invest more time and effort to maintain various types of assets from skills to reputation, and from shareable material goods to education. In the digital economy access to certain commodities and sources of income become increasingly dependent on who you know and on your previous history – not money. We have to make technologies and their applications more inclusive and distribute their benefits more widely. This requires that we either expand existing institutions (e.g. ownership) or create new ones to assume this task. Fairness and novel innovations can be better advanced by granting people a sense of greater ownership of the common assets and resources in society. We look forward to building the next era of universalism with you. 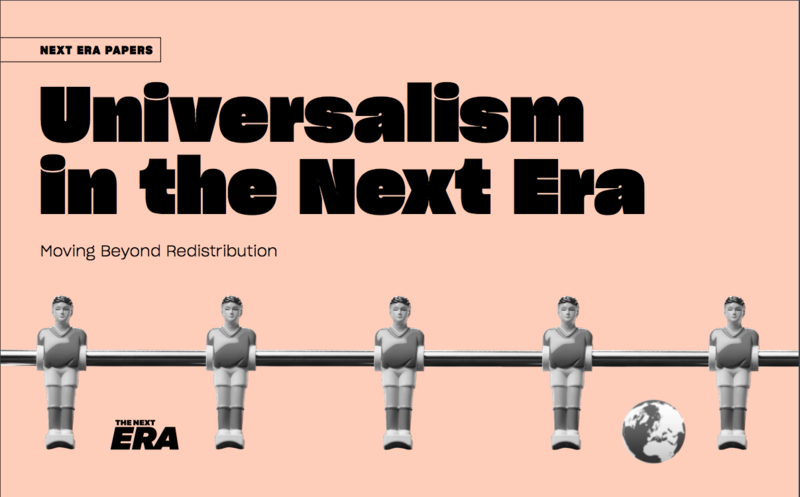 Contact our team and download our publication: ‘Universalism in the Next Era: Moving Beyond Redistribution’.